I’ve been wanting to bake ‘Poke’ cupcakes for ages. I’m not convinced that they are that different from when I’ve baked extra flavour cupcakes before and let sauce seep in though. Basically, you bake a cupcake as normal and as soon as it comes out of the oven, you prick it 5 or 6 times with a fork or a sharp knife then pour over your flavour. Most Poke cupcakes seem to contain a jelly sauce/syrup and is quite a vivid colour but I didn’t want any jelly. I used homemade Passion Fruit Sugar Syrup – Smells like perfume when you are cooking it but is fab soaked into a sponge. Preheat the oven to 180C and line 36 cupcake/muffin tins. Using an electric mixer, mix together 21oz of the sugar and 8oz of the butter until pale and fluffy. Add the eggs, 1tbsp of the vanilla and eggs whites one at a time, still using the electric whisk until they are all combined. Add the flour and the milk a tbsp/splash at a time alternately until all combined - still mixing at a slow speed. Finish mixing by turning to a high speed for 15 seconds - it will bubble! Divide evenly into each cake liner (about 1/2 full) and bake at 180C for 20 mins. As soon as the cupcakes are out of the oven, prick them using a fork at least 5 times. Pour over the passion fruit sugar syrup - slowly! Allow to sink in before adding more. While the cakes are cooling, make the Cream cheese frosting. Using the electric whisk, mix together on a fairly high speed, the cream cheese, butter and the last tbsp of vanilla extract until well combined. Turn the speed down to low (it will make a big cloud of smoke otherwise) and add a tbsp of icing sugar at a time. Depending on how thick you like your frosting and how warm a day it is, you may need to add slightly more. Pipe on top of the cooled Poke Cupcakes - I used a Star Tip. 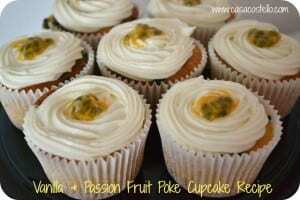 Add a blob of the pulp of the remaining passion fruit to the middle. An amazing week for the Bake of the Week crew – Thanks loads to everyone who took part. 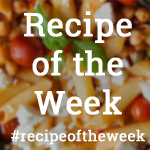 Pinterest has been playing up a bit but never fear, everyone who has entered will be added to the Bake of the Week pinterest board asap. The fabulous Julie’s Family Kitchen entered these super neat Tropical White Chocolate Cookies. I will admit to having cookie jealousy – they are so perfect. Oh Jenny from Mummy Mishaps – Your Blackberry Eton Mess Cake makes me so happy! This is definitely a showstopper that must appear at a summer party this year! Orange Blossom is a fairly new flavour to me but one that I am completely besotted with. Who could resist Kirsty from Hijacked by Twins’ Vanilla & Orange Blossom Profiteroles? We had some Hobnob Brownies from Latoyah of SugarPink Food. 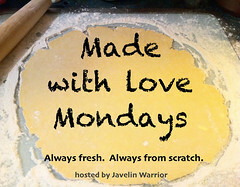 I am especially honoured that Latoyah chose Bake of the week as her first ever linky to take part in. Welcome to the family, Latoyah! If you are a fan of banana and coconut, then this Manchester Tart from Emma at Farmer’s Wife and Mummy must be right up your street. Look how perfect this raspberry chocolate tart looks? Thanks to Cooking Around the World for sharing it. Eileen from ETSpeaks From Home has reminded me that I have still not tried baking with rhubarb. This rhubarb crumble looks just the perfect recipe along with her Chinese Almond Cookies – Delicious! And the lovely Jenny from Mummy Makes Cakes has shared this fantastic Choc Chip Bundt Cake. Id discovered my bundt tin last week after a sort out – Look out for bundt cakes coming your way soon! 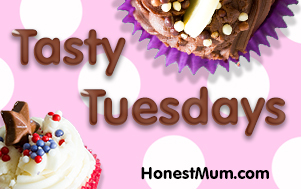 The linky is now open for this week’s Bake of the Week. It will stay open until Monday evening and a new roundup will be posted on Tuesday morning. 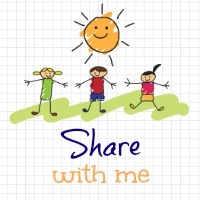 As usual, all Bakes are welcome and please share the badge to let others know they can join in too – If you have time, pop over to the other Bake of the Weekers to visit their bakes. Just beautiful, these cupcakes look almost too good to eat. I bet they taste delicious. Thanks for the lovely mention in your round up, I hope to join in soon. Oh you are so kind to think of the teachers – I scoffed most of them myself! 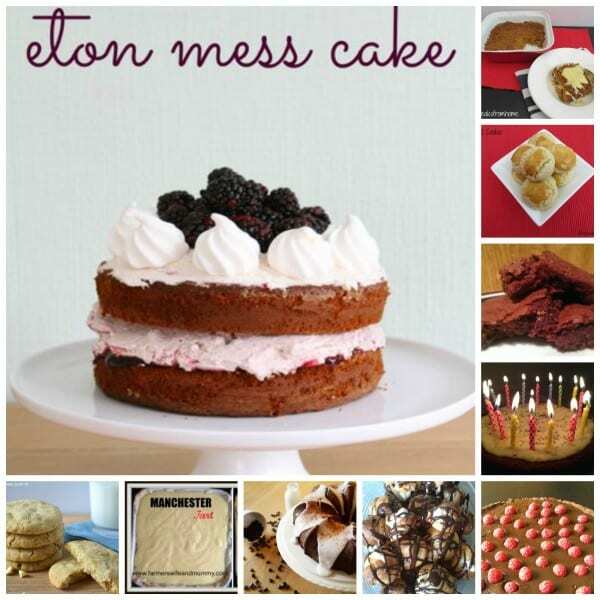 I’d completely forgotten about Bake of the Week, until I an entry just now – aghhh. 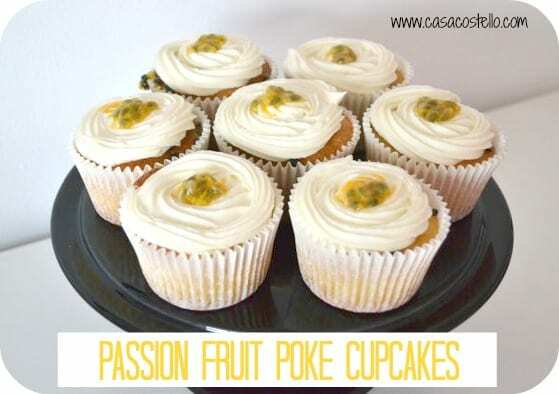 Those poke cupcakes look so pretty and I adore passion fruit, so I think it’s just as well they are not placed in front of me right now.